Bellator officials have announced the finalized lineup for the upcoming Bellator 73 event. The show will be composed of 11 bouts, including a featherweight title fight between champion Pat Curran and Patricio “Pitbull” Freire. Two tournament fights are also included in the main card event featuring a Season 6 bantamweight tournament final between Marcos Galvao and Luis Nogueira and a “Summer Series” light-heavyweight tournament final between Attila Vegh and Travis Wiuff. A fight between heavyweight fighters Ryan Martinez and Mike Wessel is also a part of the main card. The preliminary card also includes bouts between lightweights Chris Coggins and Zach Underwood, Cosmo Alexander and Harry Johnson, and a catchweight fight between Marcus “Lelo” Aurelio and Amaechi Oselukwue. Bouts between heavyweights Maurice Jackson and Chris Miller, welterweights Andy Uhrich and Joe Williams, and bantamweights Jay Black and Brian Hall are also a part of the event’s prelims. 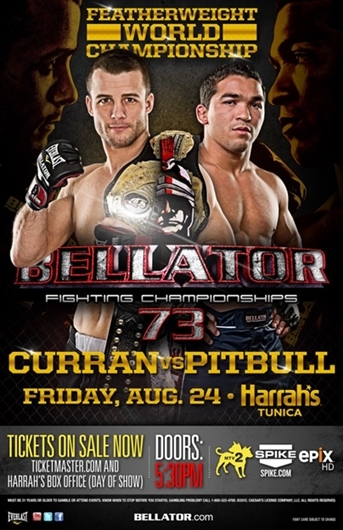 Bellator 73 will be held at Mississippi’s Harrah’s Tunica Hotel and Casino. The main card will be aired on MTV2 (and in high-definition on EPIX), while the prelims will stream live on Spike.com.